I have been remiss in blogging about my newest challenge and project. I've talked about it in Facebook, but haven't actually posted here. For Christmas, I gave myself a building! 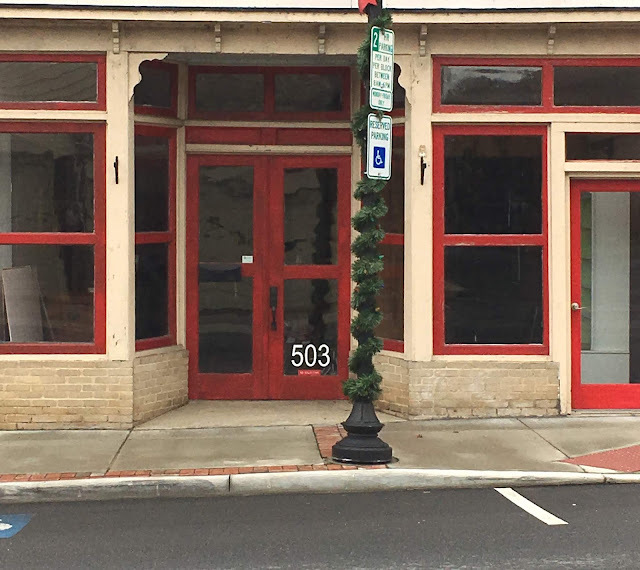 OK, so I actually signed a lease for the building, a 1920's storefront in my local town of Altavista, Virginia. Why? First of all, we're not moving or closing our shop, Sew Simple of Lynchburg. Rather this is a way to make our shop better. We are getting crowded in our current location and I kept driving around Lynchburg looking for possible places to move the shop. But there really wasn't anything that was a reasonable step larger. Just places that were huge, expensive, or not in a good location. Add to that, we still have a few years on our current lease and it is in a great location. I had spent a fabulous weekend in early December with Carol Britt from Batiks Etc. & Sew What Fabrics in Wytheville, VA where we talked about our visions for our businesses. I had shared with her my trouble seeing us get bigger, as well as my frustrations of not having time to make the projects I wanted, recording my videos, and topped off with late hours at the store trying to do that, I was missing having time with my kids. On my 2 hour drive home from Wytheville, I had plenty of time to think. I began to think of what our shop did, what our customers wanted, and whether there was anything that could be taken out of the store to give us more room for the necessary activities and products. Suddenly, it hit me, I didn't need to be there! That's sounds a bit drastic, I know, but as I thought about it, my video equipment and my sewing machine set up could be removed from the shop and would give the shop's classroom some much needed space. Additionally, I could do much of the shop's admin in a different location which would allow us to use some of the office space at the shop for processing inventory when it comes in. This is an activity that often was being done in the classroom. As a result, we often had to clean up the classroom to have a class and also, get my stuff back out in order for me to make samples and videos. I love my set up, but it takes up a lot of space in the store's classroom. But I already knew working from home wasn't going to work. I have already been doing much of my computer work from home and it just wasn't working well. There certainly wasn't room in our house for the sewing and quilting studio, plus the video equipment. So what's a girl to do? While space in Lynchburg was hideously expensive, the small town we live in (or officially, across the river from) had several vacant storefronts, like many small towns these days. I set a budget and decided that if I could find a space that fit it, I'd set up a studio space. This choice has been a real challenge! It means stepping up and making sure I am using this space to generate it's own income via video classes, pattern design, writing that book on ruler work that I really need to do, and more. Isn't it funny that even when you feel like you just can't do one more thing, life has a way of making sure we step up, take it on, and move forward? Removing a partial wall that had been added in the past. 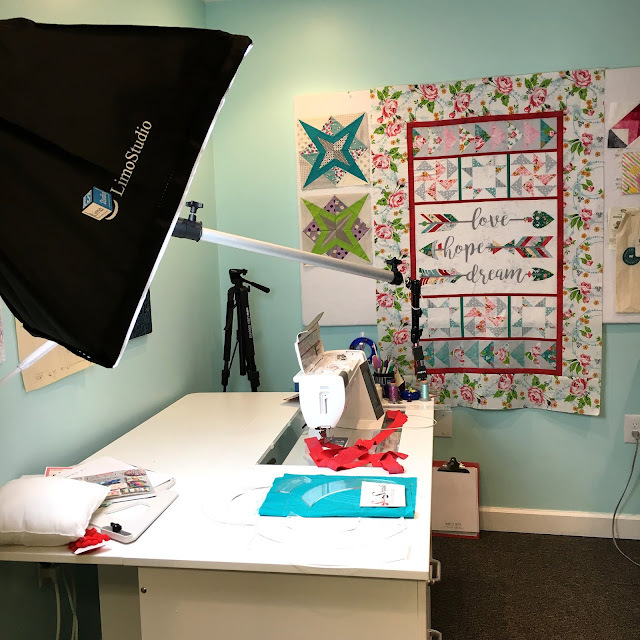 My new studio has three main areas, my quilting and video area, an open space twice as big as the shop's classroom, perfect for hosting classes and workshops, and a private back area for my office and space for my kids to hang out. Speaking of the kids.... the studio is walking distance from school for the older two, as well as the library, 2 parks, and the Y. It's a mere one mile from our house, though with the hills, river, and road between the two, not great for walking or biking from home. Since the studio will not be open to the public other than for special events and classes, they can spread out through the space. Leah is looking forward to more sewing time with me and my geeky oldest is looking forward to inviting his friends over after school to game together sometimes. Leah has asked for crafty classes for her and her friends too. The community is also asking for classes. Some are quilters, but there is also interest in just having something fun and creative to do in a small town. I'm certain we can provide that eventually. The building had been home to a series of hair salons since the 40's. The last one had an interesting mix of Art Deco meets Industrial design. In the meantime, I have a lot of work to do. Nearly 100 years old, this building has a lot of character and what has been referred to as "layers." Some of the layers are good, others, like the remnants of a past dropped ceiling and the cheap paneling put over the original bead board is not so great. 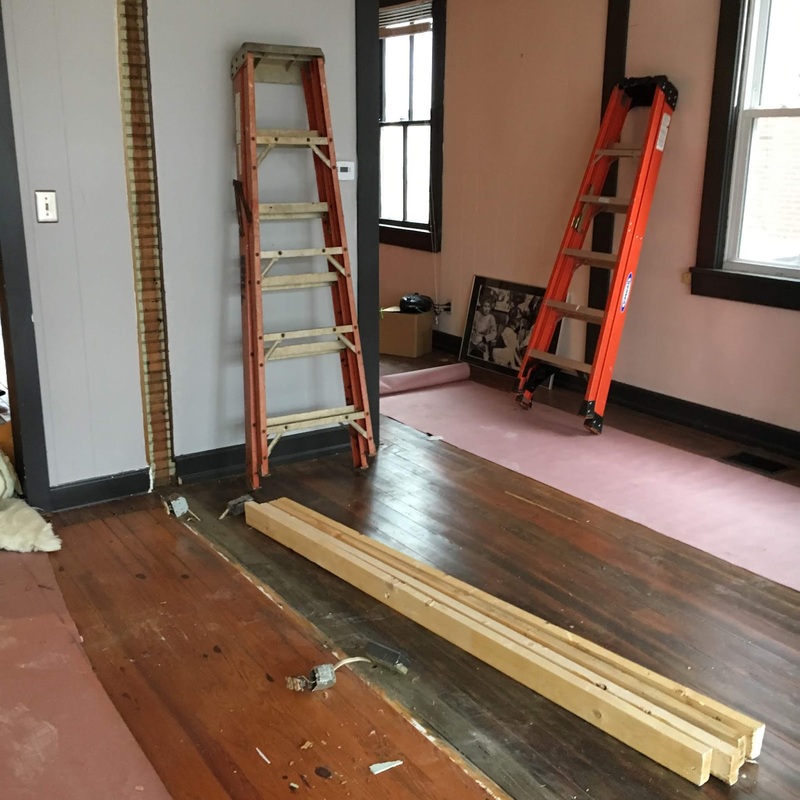 My budget is small, so the work and outfitting the space with what it needs will happen gradually, especially as I still have my duties at the shop to attend to. The painting begins. 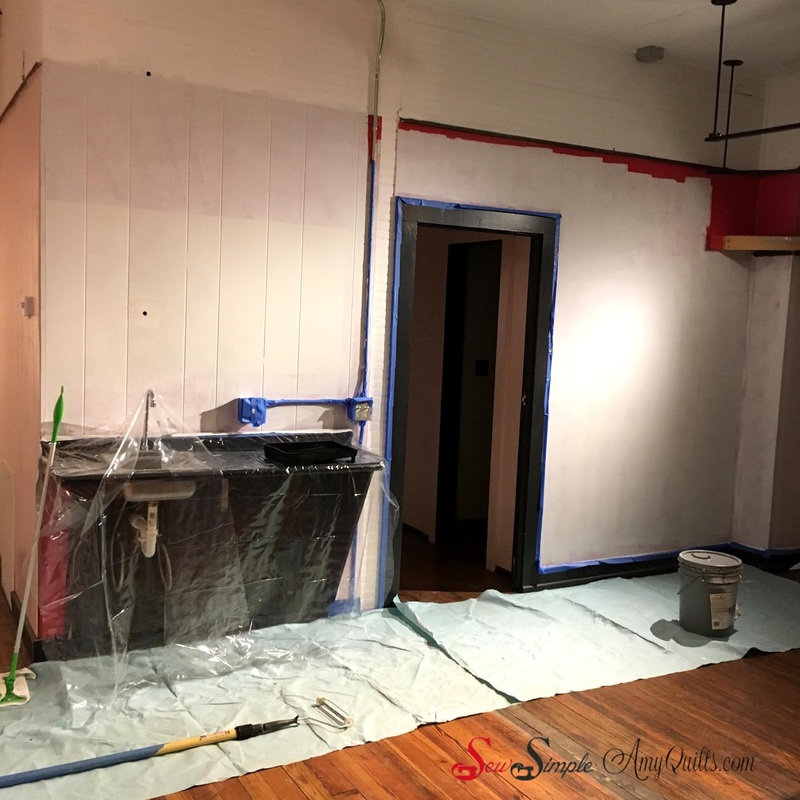 Not sure what colors we will paint the walls, but we're starting with primer. While I will be separating my duties across two places, it will allow me to be more focused, efficient, and present in each space. That's a good thing. Looks like you are on the right track and will enjoy more time with the children. When thinking correctly,I believe those doors needed open up and they did for you. Love your videos. Thank you for sharing your gift. I am a beginner who realizes I have a lot to learn but need my play time with my machine & the rulers are fun. Growing pains are necessary sometimes, and your solution sounds like a perfect fit for your needs! Congratulations on the expansion!! Congratulations. And thank goodness for primer - the walls look better already! Wow! You are one busy person and I am happy for you and hope this is a great new adventure for you and your family that will actually give you more time. Amy, how wonderful! This should really help you. I'm so happy for you. 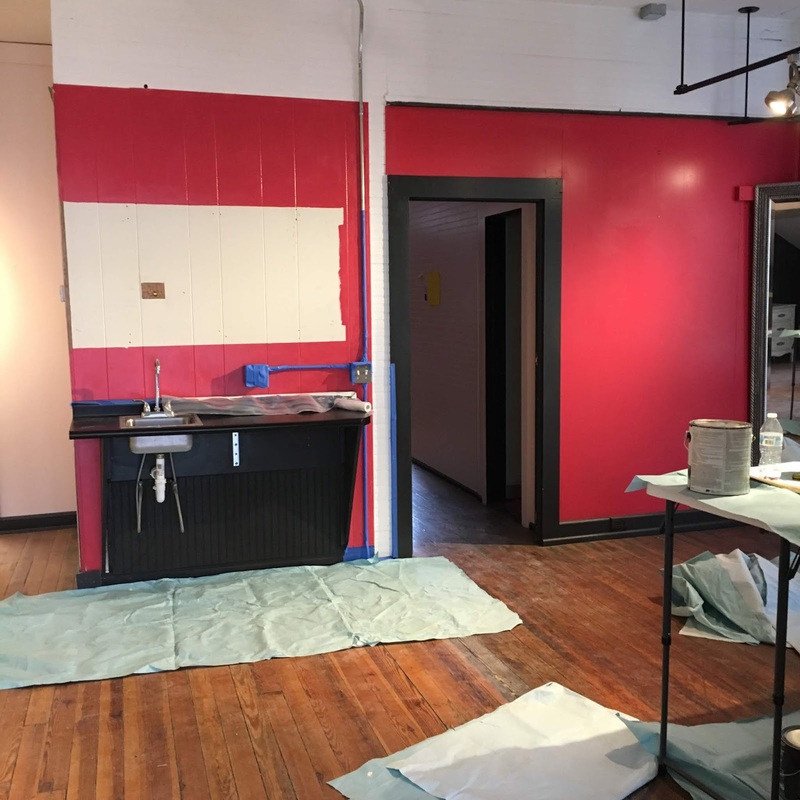 When I saw that picture with the red wall, my first thought was, THAT has to go! I see you are already painting over it. Hopefully any growing pains will be short lived. Have FUN! Yeah! If it has the capacity for multiple sewing machines you could create a little income by subletting to another maker looking for some dedicated sewing/studio space or renting it out by the day for small sewing groups to have sew in days. If I was living in the area I would be looking for both options. Wow, I remember seeing your videos way back when, then you had a Shop and Craftsy / Bluprint classes, now a second location! I am not one to comment often, but I am so excited to see all of this happening to you, and it's also fun to see that this new venture will be good for your neighbors and family. And with all that plumbing from having hair studios you need to start dying your own fabrics.